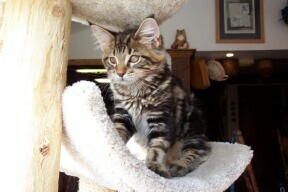 pictured at 8 months This is KittyUp Miss Belle of Pawhaven. Miss Belle was the first female in my breeding program. Miss Belle was tested for HCM on 6 November 1999......results showed no signs of HCM. She has being retired since she will not produce any kittens. She loves to be near you while sitting and watching TV. She loves to play and even fetches the plastic milk jug rings. A very nice older couple came and fell in love with her. She has settled right in. Thank you Mary and Ed for giving her a loving home. 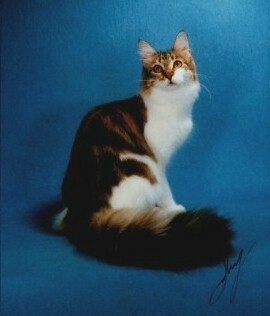 picture dated 5/22/02 This is Pawhaven's Coconiko. She was known in my home as SweetPea. While Ed and Mary were visiting and deciding about Miss Belle. Mary fell in love with this girl. When we brought her over to their house, shee walked out of the carrier and walked all over the house checking out her new home. 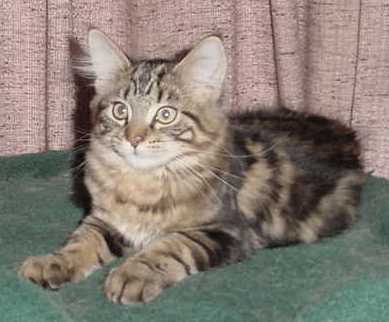 picture dated 5/23/02 This is Pawhaven's Buster Brown. Mary Jane fell in love with this boy just by his picture on this website. She went right out an bought him this cat tree.